Concrete bathrooms with colour-changing shower screens feature in this renovated apartment inside Moshe Safdie's famous brutalist Habitat 67 in Montreal, Canada, where scribbles on the walls date back to the housing complex's construction. Locally based design studio Rainville Sangaré was enlisted by a couple to renovate Unit 622 in the 1960s housing complex, which is located at 2600 Avenue Pierre-Dupuy on the Marc-Drouin Quay. Israeli-Canadian architect Sadfie's design is considered an example of brutalist architecture – the controversial 20th-century style that has since come back in vogue – and comprises 158 homes in 354 stacked, prefabricated concrete "boxes". The renovated Unit 622 is made up of two of these blocks set perpendicular to each other, resembling the shape of a T in plan. One of the wings contains an open-plan living, kitchen and dining room, while the other hosts a master bedroom and guest bedroom. A concrete wall where the two volumes meet is left exposed and is covereed with colourful markings from when the complex was constructed over 50 years ago. "The space is structured around the junction of the blocks," said Rainville Sangaré in a statement. "The concrete junction was left bare to highlight the assembly of the building." The studio's main change to the layout of the apartment was to include a new bathroom for guests. It slots in between the two bedrooms in the rear wing, alongside the master bedroom's en-suite. In both of the bathrooms, the showers are fronted by dichroic glass, which shimmers with different bright hues depending on the angle that it is viewed from. The glass casts the shower behind in bright tones of orange, green and blue, and creates colourful reflections of the other appliances. The bathrooms also feature vertical concrete wall tiles, intended as reference the structure of the brutalist building. Other details in the washrooms include zinc-plated towel racks, black round clothes hooks, and washbasins with black Corian tops and navy bases that match the frames of the mirrors above. The guest bathroom is fitted with two sinks, with the extra slender one used by the resident to wash calligraphy brushes. 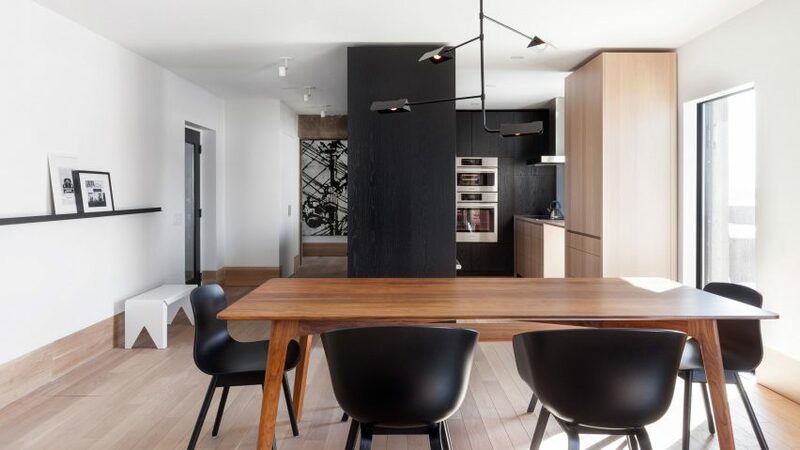 Rainville Sangaré also designed the apartment's folded black lamps. Called Unité, the lights are "inspired by the rectangular prefabricated building blocks of Habitat 67" and feature throughout the residence. The studio chose a neutral material palette for these other spaces, including white-painted walls, wooden flooring and black steel details. The hues are intended to complement the views of the adjacent Saint Lawrence River from Unit 622's large square-shaped windows. "The Habitat 67 surroundings informed the design of the space," said the team. "Given the location on the Saint Lawrence River, where it can get windy and isolated during the winter months, the material and colour palette was kept minimal to enhance light quality and tactile warmth." In the lounge portion of the main living area, black steel forms shelving that flanks either side of the window. The same material was used for a large unit erected on one side of room to store the television, books and a piece of artwork by local artist James Kennedy. The kitchen is located at the other end of the space. Built by local brand À Hauteur d'Homme, it comprises a black wooden volume with a large opening created on one side for the kitchen sink, and a paler wooden storage unit. "The kitchen uses minimal footprint but is very functional," said Rainville Sangaré. Continuing the colour theme, a dark wooden dining table with black chairs placed in the middle of the space, and a small white metal bench. Similarly neutral decor can be found in the rear of the apartment. The master bedroom features oak wardrobe panels and side tables, offset by black bed-side lamps. The guest room contains a bed that folds down from white cabinetry, so that the space can also be used as an office. Last year marked 50 years since Habitat 67 was presented by Safdie at the 1967 World Expo in Montreal. To celebrate the anniversary of the concrete complex, photographer James Brittain explored its hidden nooks and apartments in the building to offer a glimpse of day-to-day life inside. Other renovated residences in the block include a two-storey home overhauled by Canadian design studio EMarchitecture.